Background: Eczema or Atopic Dermatitis (AD) is a common chronic relapsing skin disease associated with impaired quality of life. Regular usage of moisturizer/emollient is the mainstay of management but acceptability of emollient is often suboptimal. We investigated if emollient acceptability is influenced by various clinical factors in AD. Methods: A survey on frequency of emollient usage, brands, clinical factors including disease severity (Nottingham Eczema Severity Score, NESS), quality of life (Children Dermatology Life Quality Index, CDLQI), Transpidermal Water Loss (TEWL), and Skin Hydration (SH) was performed. Acceptability was classified as very good, good, fair or poor. Results: We evaluated 128 AD patients. NESS correlated with CDLQI and the treatment domain of CDLQI. Emollient usage is elementary for AD treatment. 89.1% of patients reported that doctor’s recommendation was the major source of advice when choosing an emollient. Aqueous cream (AQ) and petroleum-derived products were among the commonly used emollients. 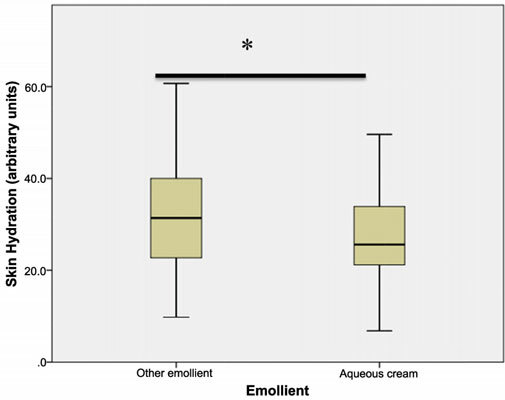 More aqueous cream users reported fair/poor acceptability (p=0.017) and lower SH (p<0.05). Linear regression showed that patients who thought their emollient as fair or poor were currently using AQ (p=0.003), their emollient not recommended by a doctor (p=0.035), with more severe disease (p=0.04), and had lower emollient usage in winter (p=0.05). Conclusion: Physicians play a pivotal role in assisting patients to select an emollient that they will accept and use consistently. The studied emollients are generally acceptable by over 80% patients. However, aqueous cream is least acceptable by patients, making it the least favorable emollient to recommend to patients. Atopic dermatitis, atopy, CDLQI, eczema, emollient, NESS, SH, TEWL.